Communities around the county are still feeling the effects of Monday's powerful storm. Officials at San Diego Gas & Electric said there are still more than two dozen "active" -- that's their unfortunate term, not ours -- outages throughout San Diego County. An estimated 4,291 customers remained without power as of 11 a.m.
More than 94,000 customers had their power knocked out at some point during the storm, according to SDG&E, but by Tuesday, the worst of the current outages was in the Nestor/San Ysidro/Otay Mesa area, where more than 1,100 homes were still in the dark. Officials said they hoped to restore power to those communities by noon. Other affected areas include Torrey Pines/Sorrento Valley/University City, where 732 lost their lights, and in East County around Potrero, where about 750 residences lost power because of a suspected problem in the overhead grid system. Monday's storm began for most in the early hours and did not abate until nearly midnight. Trees were downed around the county due to high winds, and at least a pair of boats lost their moorings in Shelter Island. In one possible case of extreme weather, a resident of Point Loma suspected a water spout may have come on land and torn up a construction site on Garrison Street. 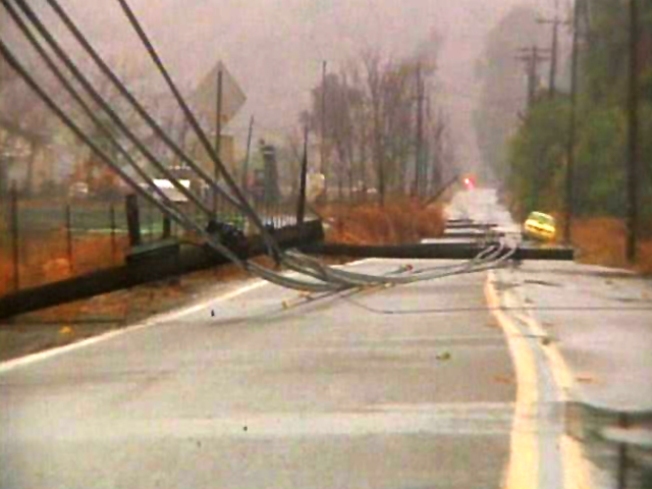 In some cases, officials said, power lines or power poles snapped. Snow fell at higher elevations, and more than an inch of rain blanketed the region nearly everywhere. Click here for updates on outages from San Diego Gas & Electric.